Note: This article covers only a small portion of what you can achieve with UberMenu, make sure you take a look at the official documentation which is linked to in the Documentation section below to explore the full possibilities of this powerful tool. As we mentioned further up, we're only going to cover how to use UberMenu and not every option it provides, to learn more about UberMenu check out the official documentation here. If you have your menu right aligned you may need to add some custom CSS to get menu items aligned correctly, including the cart and search icon. UberMenu provides the code needed along with further explanation Here. As we've provided direct integration you don't need to take the manual integration steps of modifying template files. And much much more. By utlizing the advanced content UberMenu provides you can create a stunning custom and more engaging menu for your WordPress powered site. You'll see a note on the UberMenu page about integration, as we've already integrated UberMenu you can ignore that notice, all you'll need to do is pick your menu location which would usually be Primary. Once you've set your menu location, save the UberMenu configuration and once saved, you can switch to the Basic Configuration tab. If it's not already set you'll want to set the Skin as Vanilla while you can use any skin you wish, Vanilla fits in best with X's styling straight out the box without requiring Custom CSS. Congrats! You've now configured UberMenu to the point where you can start using, to find out more make sure to view the official UberMenu doucmentation we've linked to above, in addition make sure to also check the official documentation on configuring your menu items which can be viewed here. 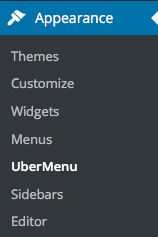 When you enable UberMenu it will overwrite your standard X one page navigation (if enabled). One way around this is to use the Menu Swapper plugin. This plugin allows you to have multiple different UberMenus throughout your site. The UberMenu developers have a great write up on using Menu Swapper here. Stability – Newer versions of software do not always equal greater stability. Oftentimes there are undiscovered bugs that are introduced with certain versions and are unknown until the product has been released to the public for some time. The version of the plugin that we bundle with the theme is more or less guaranteed to work without any issues as we take a great deal of time to test all functionality thoroughly before releasing it along with the theme. Release Cycles – While we try to include the latest version of UberMenu with each release, occasionally the release cycle of the plugin will prevent this from being possible. Essentially, since we have no idea when UberMenu will be releasing new versions of the plugin, we cannot plan our releases around this. Because of this, if we have already begun the process of finalizing our release and submitting it to ThemeForest for review while UberMenu is putting out a new version of the plugin, that version of the plugin will not be able to make it into the theme until the next release at the earliest. Not Always Necessary – Some of UberMenu's releases have only included simple "bug fixes" without any huge additions or modifications to the rest of the plugin. Because of situations like this, it is up to our discretion whether or not a new release will make it into the theme or not based on the nature of the update. Because of these reasons (among others), there is no need to register your license for UberMenu if you happen to have one. In fact, doing so is discouraged in order to prevent any potential conflicts when updating, as previously mentioned. If you happen see a notification in your WordPress admin panel asking you to register UberMenu upon activation, simply dismiss this notice. UberMenu is a extremely powerful and flexible plugin that will assist you with creating the perfect website. The version of UberMenu included with the theme is an unmodified version of the plugin. We do our best to ensure that the version of UberMenu included with X is as up-to-date as possible; however, this might not always be the case based on the reasons listed in the "Bundled Version" section above, which includes stability, release cycles, and the fact that not all updates are necessary. Any questions concerning the usage of a UberMenu feature should be directed to the online documentation referenced in the "Documentation" section above. Is Pro Megamenu implemented yet? How to make my static top header unshrinkable? Can I spread my menu horizontally (20 menu items)? Navigation Bar only 3/4 wide. Any idea why?